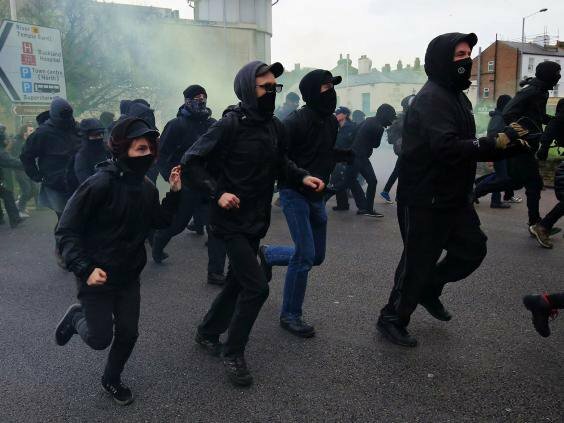 Article by the International Anti-Fascist Defence Fund about a months-long witchhunt against antifascists who were allegedly in Dover, UK, when antifascists responded to a fascists March on January 31th, 2016. Image: Antifa on the ground in Dover,UK, on January 31, 2016. Originally published by the International Anti-Fascist Defence Fund. You can donate & support the International Anti-Fascist Defence Fund: here. It must’ve been embarrassing for Dover coppers to lose control of the situation a year-and-a-half ago when they tried to respond to racist extremists marching in the streets by kettling anti-fascists there to stop the fash. That didn’t work out so well and the coppers were left with egg on their faces as area antifa worked their way around them and went on to confront & prevent the bigots from running amok as best they could. Not ones to use a humiliating situation like this to learn anything, the coppers have instead wasted taxpayer money on a months-long witchhunt to prosecute persecute the antifascists that had given them the slip on that day. Which brings us to our friend from Kent. Eleven months after the fact and just a few days prior to Christmas, our friend had his door kicked in by the coppers, who charged him with violent disorder. The resulting prison time he’s been made to serve has put his family in dire straits. When the Kent Anti-Racism Network contacted us about their mate’s plight, we were happy to kick in a few quid to help him and his family while he’s at her majesty’s pleasure. Previous post: #France: From Now On, Let’s Move From Distrust To Social Resistance!